Drones are unmanned aerial vehicles. We will be talking about the drones for civilian use, which usually take the form of “quadcopters”. A quadcopter has four propellers at the corners of its square H or X-shaped frame. Quadcopters are very stable and maneuverable. They all have four motors and propellers and a gyroscope to measure the drones position, allowing the drone to automatically alter the speeds of each propeller in order to hover and maintain stable flight. There are three main categories of drones we will be discussing. They all have different capabilities and are best suited for different purposes. 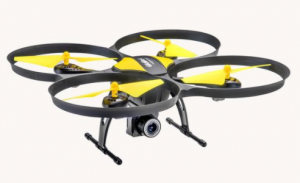 Beginner Drones are affordable drones with shorter ranges and flight times. They are easy to fly and are built durably so they can easily endure minor crashes. It’s also easy to buy spare parts for them for low prices. Hobby Drones are also affordable and durable, but often have advanced features which are targeted towards users with more experience. They may have more specialized cameras, longer ranges, or other features that make them ideal for recreational use but put them ahead of the basic starter quad. Camera / Professional Drones are more expensive drones with advanced features that allow for incredible footage and photos to be taken. They’re equipped with higher quality cameras and often use GPS tracking, which allows for a better “return home” feature and makes them easy to find when lost. Racing Drones are built for speed. The most advanced ones can go up to 70MPH or even 100 MPH in a dive. They use a first-person camera to allow you to fly the drone as though you’re inside of it. These are often flown competitively in races. Looking for something to compliment your aerial fleet? Take a look at these Best RC Boat Reviews. If you’re a more experienced hobbyist looking for an upgrade, look no further than the Altair 818 Plus. 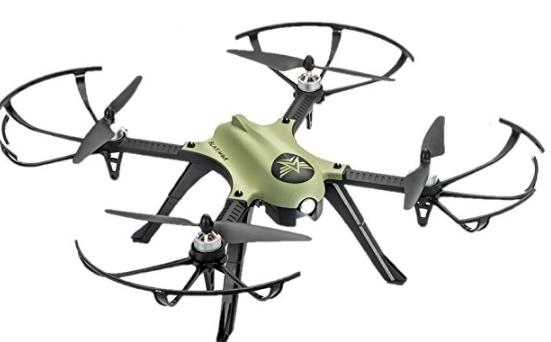 The 818 is a fabulous drone that’s great for all recreational skill levels thanks to multiple speed levels and advanced control features like heading hold mode and altitude hold mode. It also has a stable, durable design and especially impressive hover capabilities – it barely moves at all so long as the wind’s not too heavy. But where the 818 Plus really excels is in easing users into the field of aerial photography. It has 15 minutes of battery life and two batteries (basically unheard of at anything less than the professional level) and a 150 meter range that allows you to reach difficult-to-get shots and gorgeous bird’s-eye views. It also has continuous live streaming of First Person Video from 60 meters away, making it even easier to keep track of the shot. And it even comes with a TF card so that everything you need to get started making photos and videos comes right out of the box. So if you’re not yet ready (or interested in) the big leagues but you want a seriously high-quality drone with more features than the AA108, the Altair 818 Plus is a great choice for a hobby drone that won’t break the bank. The best drone for beginners is definitely the Altair AA180. This first person-view camera drone is available for only $129.80, a great price for someone first getting into drone flying. It’s small, about 7 inches by 8 inches and 1.75 inches tall, and weighs about 3 ounces, which allows for indoor flying for practice and fun. It’s great to still be able to fly your drone on a windy or rainy day! This Altair drone offers 10 minutes of flight, with a low battery alarm and an out of range alarm. It also features headless mode which prevents beginners from getting mixed up and crashing their new drone. 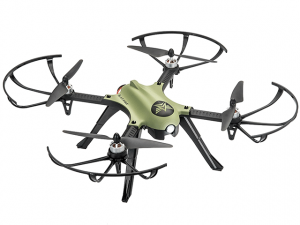 The range is 330 feet, which is excellent for such an affordable drone. It’s a stable, easy-to-fly drone with three levels of flying difficulties. 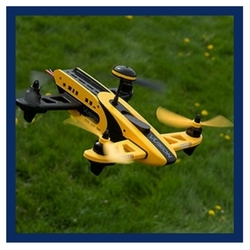 Level 1 is for kids and beginners, making this a great first drone. It comes with 4 extra propellers and 4 extra rubber foot guards, which, as all drone enthusiasts know, is something you’ll be very glad to have. 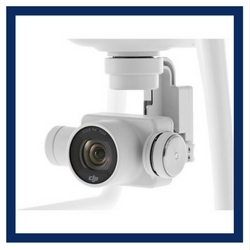 The Altair AA180 comes equipped with a 720P first-person-view wide angle HD camera that takes video and pictures. It’s perfect for getting familiar with the amazing photographic capacities of drones. The video goes straight to your phone, meaning you can share it right away with friends and family. 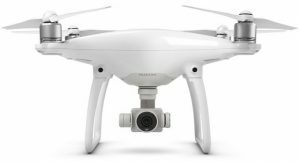 The best camera drone is the DJI Phantom 4. If you’re looking to use your drone for professional purposes, don’t settle for anything less. It can automatically take off and return home using GPS technology. 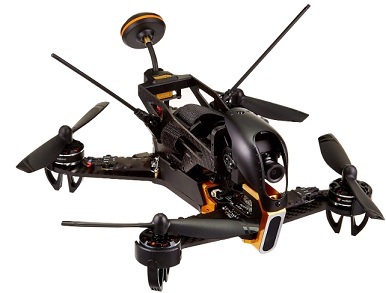 It can fly at up to 45 MPH and fly itself intelligently and avoid obstacles. It has a flight time of up to 30 minutes. The drone also comes built with redundancies to improve reliability. It uses a gimbal for stable footage and can capture 4k ultra HD video at 30 FPS and slow-motion footage at 120 FPS. The lens offers a broad view and captures perfectly crisp images. You can also use the DJI director software with the included video editor to add music, text and many other things to your video footage, which will be extremely useful for those working in videography. Basically, this is the perfect camera drone and it can be purchased for as low as $995. We can’t talk about hobby drones without mentioning the Blackhawk. The 818 Plus is a great choice for beginners who need lots of ease-of-use features, but if you’re ready for something more advanced, this is a great choice and the best budget long range drone out there. The Blackhawk has a very durable metal body and a shape that’s designed to give it a stable hover, making it another excellent choice for those interested in aerial photography (though you’ll have to buy a camera separately.) But it’s not really a drone with a lot of features – it’s more about going faster, flying farther, and being better to fly than anything else in its price range. The Blackhawk has a seriously impressive flight range of 300 meters and 15 minutes of flight time (keeping pace with our best drone for hobbyists.) It handles like a dream and can be easily adjusted for perfect total control of the vehicle. Plus, this drone is fast, and it’s a heck of a lot of fun to fly. So if you’re looking for an advanced hobby drone that won’t leave a dent in your wallet, you can’t do better than the Blackhawk. Our favorite racing drone is the Walkera F210 Professional Racer. True – at $609 it’s a little out of the price range of most casual drone enthusiasts. But it has an incredible top speed of 50 miles per hour, making it one of the fastest drones you can purchase today. Plus, unlike other racing drones, the F210 comes with everything you need right out of the box with only minimal assembly. 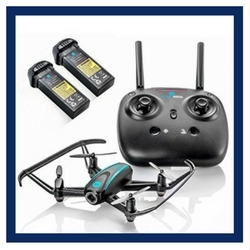 It flies for 9 minutes per battery, has a high-quality 700TVL FPV camera that’s better than the cameras on most other racing drones, and the body is extremely durable. This is just a great racing drone all around! Beginner drones are for people who want to fly for fun and don’t want to spend several hundred dollars. Anyone new to flying drones should practice with these, regardless of whether they want to use drones professionally later on. Learn to walk before you run. These drones are for entertainment and taking basic videos and pictures. Hobby drones are for amateur photographers and videographers, “geek” tech fans, and people who are into RC toys and don’t want to break the bank. Professional drones are for photographers and videographers who want to take their art form to the next level. There are serious advantages to getting visuals from the angles and positions that only a drone can provide. They’re also for anyone seeking to make money off drones, because are the long-range, high-tech drones that can be depended on for difficult tasks. These drones are pricier but are certainly a good investment for any professional. Racing drones are for people who want to compete and go fast. These are primarily for skilled fliers, because they can be difficult to control and can crash before you know it. If you really want to see what a drone’s flight capabilities are, you need to fly a racing drone. However, only purchase one if you’re willing to make the repairs, because they are more prone to crashing than any other kind of drone. For additional information on great drones check out our friends at yourdroneshq.com. The most important feature to look for in a drone is a long flight time. It’s not so great when you’re having fun with your drone and have to stop before you want to and charge your drone for a long time. Flight times vary from around 5 to 30 minutes, with beginner drones typically topping out at 10. Your flight time also has a lot to do with how much you can take advantage of your range and whether you can do a lot while it’s far away. Therefore, even with extra batteries, a short flight time limits your enjoyment of your drone. You’ll want to have extra batteries so you can just switch them when one runs low. The more fancy and expensive the drone, the more expensive the battery. Ultimately, if you’re preparing thoroughly, maximum flight time can become a function of how many charged batteries you can take with you. You have to fly it back and change it really quick, but that pales in comparison with charging it for over an hour. So, when you’re considering flight time during the drone buying process, factor in how much its extra batteries cost! Having a good range can be key, depending on what you want to use your drone for. Ranges go from about 55 to 110 yards for beginner drones, up to 3 miles for the most advanced drones. If you’re using your drone for racing or for high quality footage, you need a long range. However, for a hobby drone it isn’t vital to have a long range, because you can walk and follow your drone if you need to go further. Cameras come with almost every drone. Some are optional to install, so if you want your drone to fly longer, leave the camera off. However, chances are you’ll want to explore taking video and pictures from the sky. Higher quality cameras are included with more expensive drones, and if you’re really into capturing images and video, the camera specifications might even be the main thing you consider when choosing a drone. Headless mode is an important feature that makes it easier to pilot a drone, especially for beginners. Say you start by flying your drone away from you, meaning it’s front or “head” is facing away from you. Then you turn it around 180 degrees and start flying it towards you. Now it’s head is facing in the opposite of its original direction, meaning if you move the stick left, the drone will move to your right and vice versa. This can be confusing because drones don’t look like planes, with a clearly defined nose and tail. Most drones are quadcopters and the front looks pretty much the same as the back. Unless you’ve had a lot of practice, you will get mixed up at some point, and going the wrong way can cause a crash. When headless mode is on, no matter where the head is pointing, when you move the stick to the left of you, the drone will move left, up and it’ll move away from you, and so on. This keeps flying very simple. If you’re new to flying drones, get one with headless mode. This feature allows you to simply press a button that causes the drone to fly itself back to you. More expensive drones will have better return home features, including obstacle avoidance. 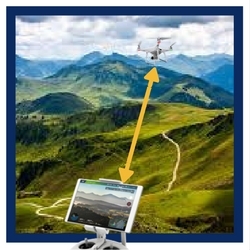 If your drone has no GPS it will simply go backwards when you hit the button, so make sure to do it in headless mode, or else it might consider backwards to be many different directions rather than towards you. Gimbals prevent your footage from being all wobbly. Your drone changes direction and tilt a lot and without a gimbal, its doing so can make the video footage look shaky and tilted if you’re not skilled enough at flying to keep it level at key footage capturing moments. 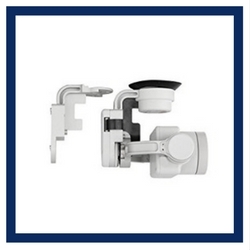 Gimbals are vital to producing professional looking videos. – If you’re just starting out flying drones, there a few things you should think about before you buy a drone. Most importantly, you should consider price. It’s best to go with a cheaper drone when you get started, because it’s likely that you’ll crash it and you want something that can be fixed for cheap. – Also, you don’t know exactly what features you want in a more expensive drone until you’ve flown for a while. When you’re entering the drone world, you should start simple and work your way up to more advanced drones. – The cheaper drones don’t have cameras that are as nice or have as many features. You’ll have to pay more for those, but be patient and get flying experience with the cheap drone before you invest in the more advanced drones. – If you live in the United States and your drone weighs more than .55 pounds, you need to register it with the FAA. Many beginner drones weigh less than that, in case you want to avoid doing that at first. – Please remember to never fly your drone out of your line of sight. First-person views can make it temping to try it but you can’t see every obstacle unless you’re looking with your own eyes. You should always bring an extra charged battery so you don’t have to stop flying before you want to. What are RTF and ARF Drones? Many people wonder what the difference between an RTF (Ready-to-fly) drone and an ARF (Almost-ready-to-fly) is. RTF – These are good for beginners and anyone inexperienced with model and RC construction. They come completely assembled in the box and can be flown very quickly after opening. The convenience is desirable as well as not having to wait hours after getting your drone to enjoy it. BNF — A subset of ready-to-fly planes are BNFs, or Bind-and-Flys, which come with everything but the transmitter, which allows you to choose your own. You then bind the transmitter to your drone and you’re ready to fly. ARF – These are for the DIY (do-it-yourself) type of people who want the satisfaction of creating what they use. They come partially built, but there’s a considerable amount of assembly involved and it will likely take hours. These aren’t usually much cheaper, so you should favor these only if you’ll have fun building it. I’m new to flying drones. How do I avoid crashes? The most important part of avoiding crashes is having a cautious flying style. Always keep your drone visible to the naked eye. Fly your drone in open areas and don’t let it get too far away from you. Don’t fly it on windy days, in the rain, or in dim lighting. If you keep your drone at least 30 feet from any obstacles, you’re not likely to crash it. If you can, take advantage of headless mode. Get plenty of practice and follow these tips strictly. I don’t know what a lot of these drone-related acronyms and words mean! Can you define them all? Would you please recommend a drone for me.? Probably the DJI Spark. Have you considered it?